One of the handsets people look forward to each year is the Galaxy S flagship from Samsung. The manufacturer has a good reputation in smartphone spheres, with its Galaxy S line being a strong competitor to iPhones. The official announcement of Galaxy S10 is due on 20th February, 2019. That’s only a few days before MWC 2019 where it is purported to be the point of discussion. While nothing has been confirmed yet, there are several rumors and leaks which give us a fair idea of what the newest flagship will include. To give you some insight of what to expect, we’ve compiled the most relevant information from these rumors. Galaxy S10’s design will be somewhat similar to its predecessor. The major difference will be the hole-punch cutout which will enable Samsung to reduce the size of the display’s bezels without having to integrate a notch for accommodating the front camera. 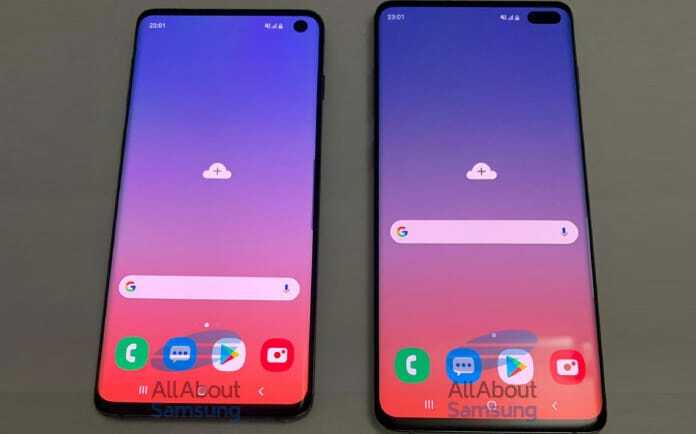 The Samsung Galaxy S10 with the latest display will feature two front-facing high-end cameras in a double-wide hole. The upcoming handset is said to include a flat display, compared to the curved screen that’ll be present on higher-end models. As with past models of Galaxy S, the phone’s bodies will be an aluminum frame present between the glass on the back and front. Samsung will also be providing users with a range of color options between models, ranking from Blue, Prism Green, Pearl White and even “Yellow” on the lower-end Galaxy S10e. Based on all the leaks and rumors that have surfaced till now, we have gained a pretty good insight into what the different versions of Galaxy S10 will feature. 5.8 inches’ screen, 1440*2960 resolution, 568 ppi density, Qualcomm Snapdragon 855 Exynos 9820 processor, 6 GB RAM, 128 GB storage, 3,100 mAh battery, Android 9.0 OS, 12 MP dual cameras (wide angle and telephoto), 8 MP front camera, Bluetooth 5.0, NFC, wireless charging, IP68 water resistance, side-mounter or in-display fingerprint sensor. Its weight and dimensions are currently unknown. 6.1 inches’ screen, 1440*3040 resolution, 540 ppi density, Qualcomm Snapdragon 855 Exynos 9820 processor, 6/8 GB RAM, 128/512 GB storage, 3,400 mAh battery, Android 9.0 OS, 12 MP triple-cameras (wide angle, telephoto, and the third one is unknown), 8 MP front camera, Bluetooth 5.0, NFC, wireless charging, IP68 water resistance, In-display Ultra-Sonic fingerprinting sensor. Its weight and dimensions haven’t surfaced in leaks yet. 6.4 inches’ display, 1440*3040 resolution, 512 ppi density, Qualcomm Snapdragon 855 Exynos 9820 processor, 6/8/12 GB RAM, 128, 512 MB or 1TB storage, 4,100 mAh battery, Android 9.0 OS, 12 MP triple-cameras (wide angle, telephoto, and the third one is unknown), 8 MP dual front cameras, Bluetooth 5.0, NFC, wireless charging, IP68 water resistance, In-display Ultra-Sonic fingerprinting sensor. There’s no word on its weight and dimensions yet. Most speculations point towards the fact that all Samsung Galaxy S10 variants will arrive with the Exynos 9820 or Qualcomm Snapdragon 855 processors, with chipsets varying by markets, and at least carry 6 GB RAM. S10 and S10+ will also have an 8 GB option, while Galaxy S10+ will also offer 12 GB RAM. The devices may even utilize the LPDDR5 DRAM that Samsung recently announced – it’s 1.5x faster than its previous versions. Internal storage space will begin from 128 GB and will expand to 1 terabyte in the S10+ model. Galaxy S10’s battery capacity will also be seeing improvements. According to reports, the S10+ could arrive with a 4,100 mAh battery, which is 600 mAh more than Galaxy S9’s 3,500 mAh offering. The basic level S10e is expected to carry a 3,100 mAh battery while the mid-tier S10 will bring a 3,400 mAh battery. The camera part is where it can be somewhat confusing. Galaxy S10e will have three sensors, two 12 MP back cameras with telephoto and standard lenses and one front facing 8 MP camera. S10+ and S10 will arrive with a triple camera setup, with two cameras of 12 MP at the back (standard and telephoto, and a third one that’s likely to be a wide angle lens). The bigger Galaxy S10 will have two front-facing 8 MP camera setup while the standard Galaxy S10 will arrive with a single 8MP camera. All Galaxy S10 phones are said to be featuring in-display fingerprint sensors. However, the budget model could come with a sensor that’s embedded on the phone’s side. 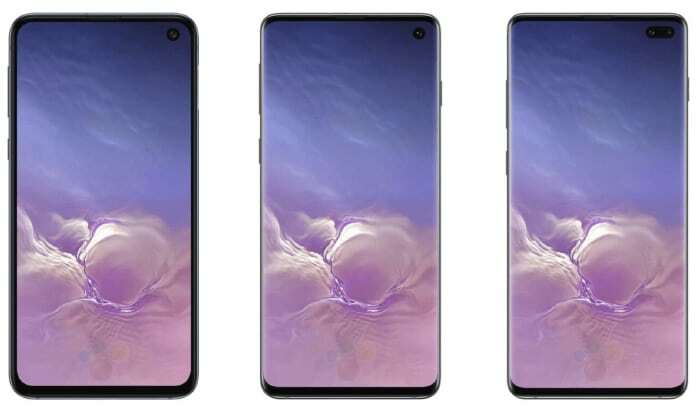 The Galaxy S10+ and S10 will also feature the use of triple camera on the back and front. The type of configuration is unknown, but we expect a combination of wide-angle, telephoto, and main camera lens. The lower end Galaxy S10 will have a dual camera configuration which isn’t a bad option. For those wanting a good camera and not stressed about add-ons, this lower-end Galaxy S10 will get the job done. Though not exactly an addition, the 3.5mm headphone jack will be glad to know that based on leaked images and renders, it will be arriving in the S10s. If you were of the opinion that the price of these devices would be reasonable, you’re mistaken. Leaked reports reveal that the handsets won’t come cheap, even the lower end will begin at $900. The 1TB Galaxy S10+ could go up to 1,800 USD. Excited for Galaxy S10? We sure are.